First Lady Melania Trump’s wax figure was introduced by former White House press secretary Sean Spicer at New York’s Madame Tussauds on Wednesday 25 Apr. In an interview with a representative of the museum, Spicer said that the first lady is “a very caring and gracious woman.” “I don’t think the American people have fully appreciated the level of intellect that she has and her political savviness,” he added. The wax figure titled ‘Give Melania a Voice’, is an interactive display which encourages visitors to take a picture and interact with it. Museum patrons can publish tweets on behalf of the first lady on @MTMelaniaMoments Twitter page from Thursday until 31 May. 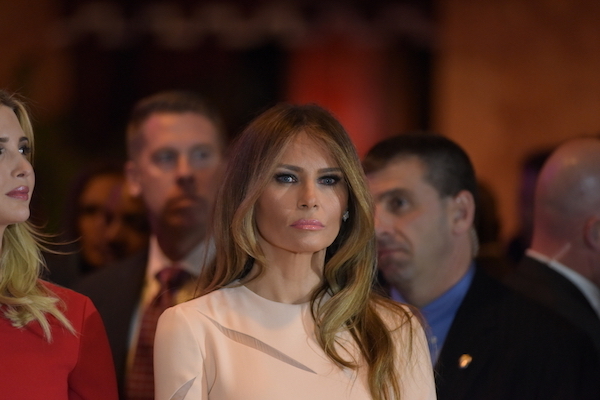 Melania Trump’s figure will stand next to president Donald Trump in the museum. Some Twitter users also noticed the striking resemblance between the wax figure and Caitlyn Jenner. “Sub headline: Looks vaguely like Caitlyn Jenner,” a user pointed out. Scroll down to see more reactions. Also will the "first lady" be wearing a two piece? and it reminds me of Caitlyn Jenner. Why is there a statue of Caitlyn Jenner next to Trump?